"It would be one less major player," a commercial real estate finance expert at New York University Schack Institute of Real Estate, Lawrence Longua, said. "It is probably more of a psychological effect, but it is one more piece of bad news." The Treasury Department and the Federal Reserve stepped in yesterday to help Lehman Brothers put itself up for sale, according to a report published on the Web site of the Washington Post last night. The sale has yet to be finalized, but could be announced this weekend before Asian markets open Monday morning, the report said. Among the companies that have been named as possible acquirers include Bank of America Corp., the French bank BNP Paribas, Germany's Deutsche Bank AG, and Britain's second-largest bank, Barclays. The deal comes on the heels of Lehman's announcement Wednesday of a $4 billion third-quarter loss and a plan to spin off its weaker assets, including between $25 billion and $30 billion of commercial real estate investments, into a separate publicly traded company. The news sent its shares into a tailspin. They dropped 40% yesterday, to $4.22, and have lost more than three-quarters of their value since Monday; Lehman Brothers stock is down more than 90% since its high of $67.73 last November. The news comes as a blow to an already beleaguered Manhattan commercial market. The bank has been a key player, financing office buildings, hotels, and retail centers, and boasts a portfolio with investments in America, Europe, and Asia. Last year, Lehman Brothers partnered with Tishman Speyer Properties in the $22.2 billion acquisition of Archstone-Smith Trust, an apartment building operator. "They are a large player in real estate transactions, and this adds to the fact that we are still not at the bottom of this market," a partner at the law firm Orrick who heads up its New York real estate practice, Alan Pomerantz, said. "They are an important financial capital markets player in the New York City marketplace, and a group of very smart people would be scattered elsewhere." Among some of its notable deals was financing real estate firm Broadway Partners' buying spree in 2006 and 2007, during which it purchased two portfolios of properties from Beacon Capital totaling more than $8 billion. The bank also helped Broadway Partners acquire a number of Manhattan buildings, including 340 Madison Ave., 450 W. 33rd St., and 280 Park Ave.
Lehman, which said about 58% of its real estate portfolio is in debt, while 26% is in equity, and 16% is in securities, also was a lender for SL Green Realty Corp.'s $475 million mortgage financing of 1166 Sixth Ave., and the $625 million refinancing of 1515 Broadway. In addition to hurting the lackluster Manhattan commercial lending landscape, Lehman's possible demise could also throw into play the bank's one major brick-and-mortar asset: its 38-story headquarters at 745 Seventh Ave., at 49th Street. The building boasts more than 1 million square feet of floor space and could be worth as much as $1.1 billion, according to the executive vice president and principal at CRESA Partners, Robert Stella. Lehman Brothers paid $700 million for the building in 2001. The last time the Treasury Department facilitated the sale of an investment bank — J.P Morgan's acquisition of Bear Stearns earlier this year — one result was that J.P. Morgan moved its employees into Bear Stearns's Midtown headquarters, abandoning its plans to move into new headquarters at the World Trade Center site. 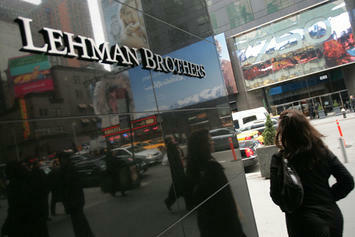 There are also many questions remaining over how Lehman will structure its spin-off. "I am still uncertain how they are going to finance this new vehicle," the managing director of research firm Real Capital Analytics, Daniel Fasulo, said. "Not only are they supposed to provide new equity, but they are supposed to be loaning the new entity $7 billion. Where is that $7 billion going to come from? Right now I have a lot more questions than answers." This article was first published by the New York Sun.